Sportier, longer range than Nissan Leaf. 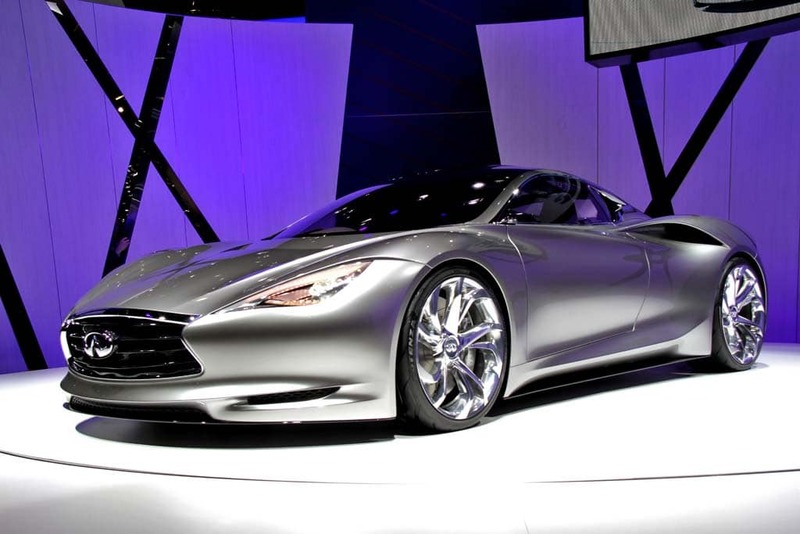 The Infiniti Emerg-E concept vehicle first seen at the Geneva Motor Show this month. The Nissan Leaf is about to get a sportier sibling. The Japanese maker’s luxury brand Infiniti will pull the wraps off its own battery-electric vehicle during the upcoming New York Auto Show. While company officials are holding most of the details for that April introduction, they revealed to TheDetroitBureau.com that the Infiniti battery car will share the same underpinnings as the Leaf it will be “more aggressive” in terms of both looks and performance. “It was designed to be a luxury vehicle first and an electric vehicle second,” said Infiniti marketing manager Sam Chung. The new model – which Infiniti has yet to put a name to – will be Nissan Motor Co.’s second battery-electric vehicle, or BEV, underscoring the Japanese maker’s expansive electric propulsion program. Along with its French alliance partner Renault, Nissan plans to have capacity in place to produce over 400,000 electric vehicles annually by mid-decade. That includes a new facility operating alongside the current Nissan assembly plant in Smyrna, Tennessee. But while they share the same foundation, with the Infiniti model, “Zero emissions is something we’re pursuing in a more aggressive way” at Infiniti, said Chung. The body of the new model will be more sporty, with at least a hint of the luxury brand’s popular G-Series styling. It may also adapt such details as the crescent-shaped kink in the rear pillar that can be found on the new Infiniti JX crossover. It may also reveal the influence of the Infiniti Emerg-E battery car prototype introduced at the Geneva Motor Show this month. Officially, the model coming to New York is being described as a “concept,” but in keeping with Nissan and Infiniti tradition, company officials said, it will be very close to the ultimate production model. The basic powertrain also will be shared with the Leaf, and in this case, the Infiniti BEV will adopt the mid-cycle refinements Nissan plans to introduce on the 2013 Leaf. That includes a more efficient electric cabin heater – which will draw significantly less power, improving cold weather range. The power electronics and other systems will also see improvements over the original Leaf, launched in late 2010. The battery pack, meanwhile, will be larger than the current 24 kilowatt-hour lithium-ion pack in the Nissan Leaf, confirmed Infiniti product planning manager Sean McNamara. He declined to say how much bigger, but the additional battery capacity will be needed to support the improved performance of Infiniti’s first electric vehicle without sacrificing range. The current Leaf model is rated at 73 miles per charge on the EPA’s Combined driving cycle, though Nissan says it can get about 100 miles on the highway under ideal conditions. The Leaf sacrifices performance to get there, with a 0 to 60 time in the 11 second range. While officials are waiting until the NY Auto Show to reveal more details, company insiders hinted something at or below 9 seconds might be possible. The new Infiniti battery car will also adopt a 6 kWh charger which will allow a fully depleted battery to reach 100% range in half the time of the system used on the current Leaf. The Nissan model will upgrade from the present 3 kWh charger in December. Some critics have questioned Nissan’s battery car strategy, noting the relatively modest demand for the Leaf, as well as the Chevrolet Volt plug-in hybrid, last year. Together they generated barely 20,000 sales. And while Leaf volume was nudging up towards 1,000 a month in the latter part of 2011 that slipped to just 676 in January 2012 and 478 last month. Nissan spokesman Dave Reuter argued that the slide was the result of Nissan expanding Leaf distribution to other international markets ahead of a ramp-up in production. He said the maker expects to see a sharp rise in the months ahead, and it is targeting volumes closer to 20,000 for the year. TheDetroitBureau.com will cover the unveiling of the Nissan battery car next month in New York. This entry was posted on Wednesday, March 21st, 2012 at and is filed under Automobiles. You can follow any responses to this entry through the RSS 2.0 feed. Both comments and pings are currently closed.